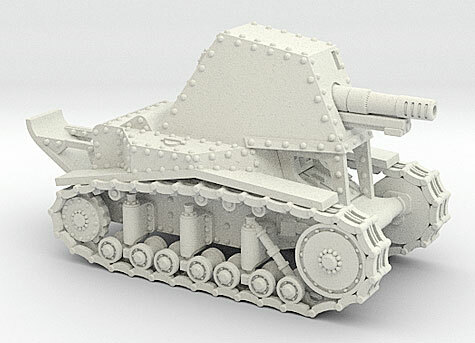 This is my 3d-printed Soviet T-27a tankette in 1/100 (15mm) scale, along with a Peter Pig WW1 British artilleryman for scale. I thought it turned out pretty well, for a WSF print. 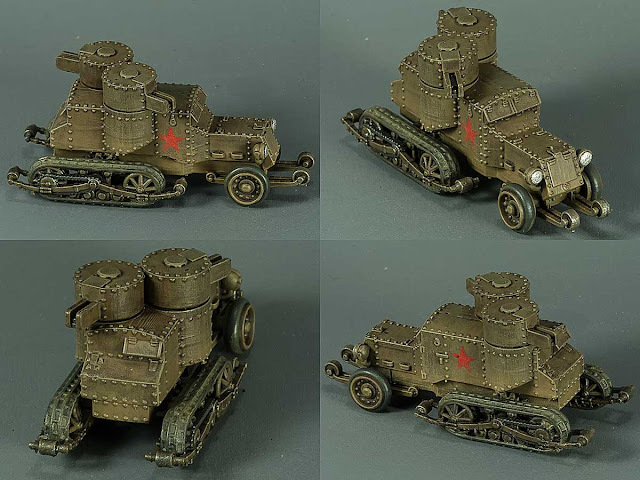 This is my 3d-printed model of the WW1-vintage Russian Garford-Putilov armoured truck, based on the chassis of the American chain-driven Garford lorry. It served throughout the First World War and after, used both by the Soviets and organisations like the Freikorps. Apparently the Germans even encountered some outside Leningrad (?) in WW2, though they didn't last long. It really needs to be printed in FUD, because in WSF it's lost most of its rivets, and rivets are unequivocally good. 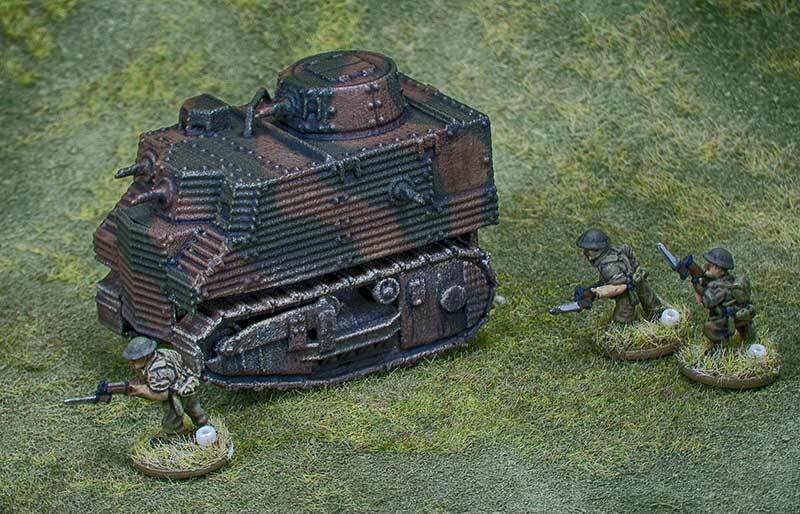 Behold, the mighty 15mm Bob Semple tank, in all its majestic glory! The colour scheme is somewhat conjectural, as nobody seems to know for sure exactly what the colours were. The darker colour was definitely green, but the lighter tone might have been red-brown (as here), a lighter khaki-green, or possibly even a darkish yellow ochre. Other markings are completely absent in any of the photos I've seen — no serial numbers, no national or tactical markings. I imagine that if it had ever actually gone into action, it would have been supplied (very briefly) with those things. 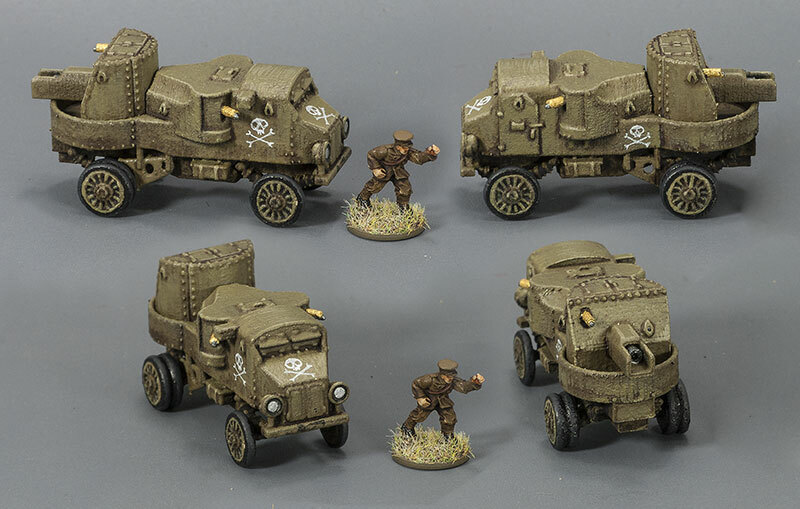 Here's the latest batch of my 15mm models, received from Shapeways this morning, all in WSF nylon. I've de-sprued turrets, scrubbed them down with a toothbrush to remove any excess nylon powder, and sprayed them with a pale grey primer to make it possible to photograph them, but that's all that's been done to them thus far. 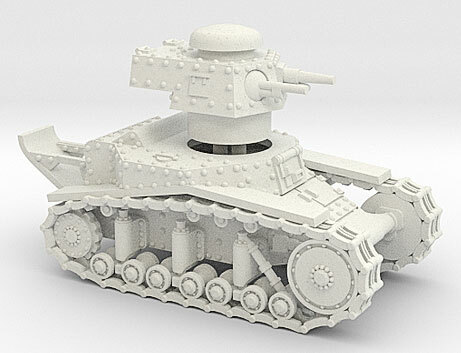 The limitations of the 3d printing process and material shows up most starkly in the steeply-sloped glacis of the Garford-Putilov's turret. The print layers are very apparent there. However, overall I'm quite pleased with them. 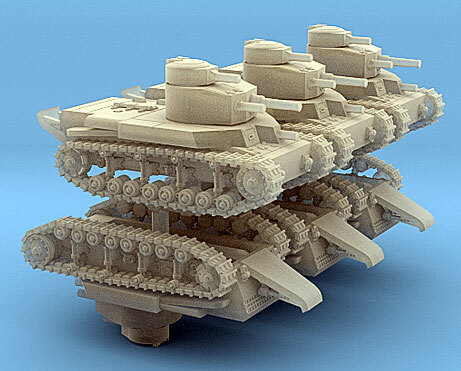 As I've mentioned before, WSF isn't adequate for scale modelling purposes, but for wargaming models it's just fine. Desktop stereolithography printers for high-resolution resin printing are available now for well under $US5,000, so I'm hopeful of being able to afford one of my own before senility sets in irretrievably. I've done nothing new today, but what I have done is remodel my 15mm (1/100 scale) Vickers Medium Mk.III quite extensively. I wanted to try to get the price down a bit, and I did succeed — I managed to knock a couple of bucks off the price in WSF, but pretty much halved the price in FUD. So that's nice. More importantly, I'm a lot happier with the construction now. This was my very first Blender model, and my inexperience with that programme and with Shapeways' limitations were apparent. It's better now. There's more that I could do to improve it, but not much useful stuff, so I'll probably leave it here. 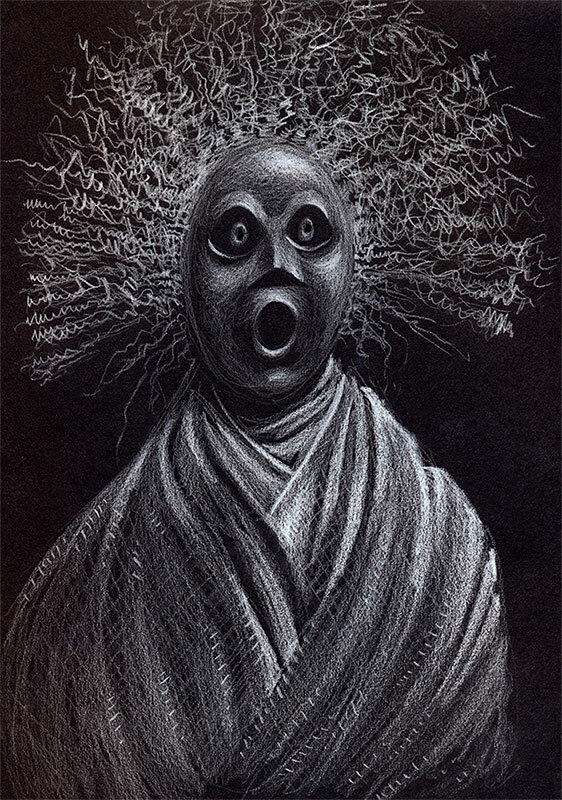 White pencil on black paper. Approx. A4. 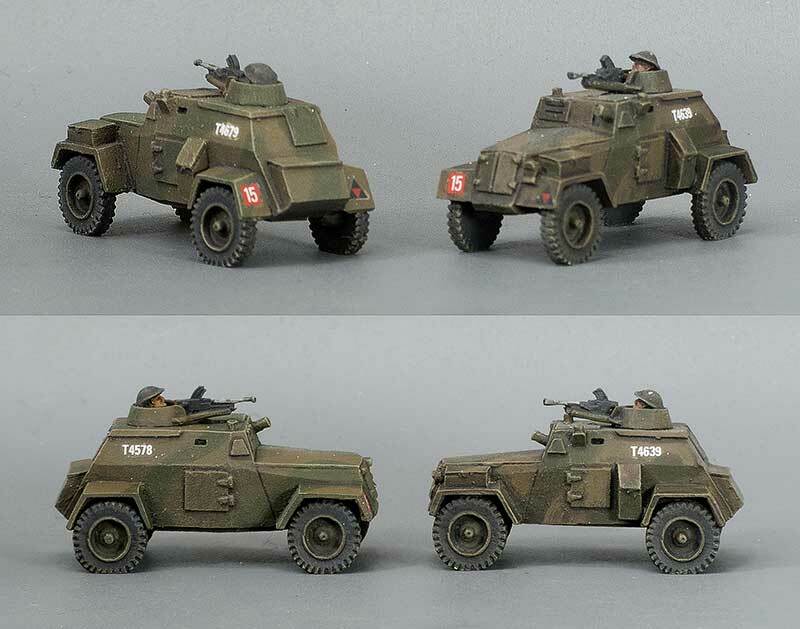 Not one of my own designs for a change, this is the 15mm (1/100 scale) Humber LRC (Light Reconnaissance Car) from Battlefront. I've had these sitting around for years, and just got around to getting some paint on them. The markings are, I'm pretty sure, quite wrong — they're just a bunch of decals I happened to have to hand. In progress: the Komintern artillery tractor, which was based on the running-gear of the T-24. I thought it would be a doddle, since I could just re-use the stuff I'd already done for the T-24.... and to a certain degree, that's true. Except that I had to make a new drive wheel, new idler, and new track links. But at least I did get to use the suspension and road wheels, so that's nice. I'm tossing up at the moment whether to leave the windows blank, or make holes in the cab shell for them. 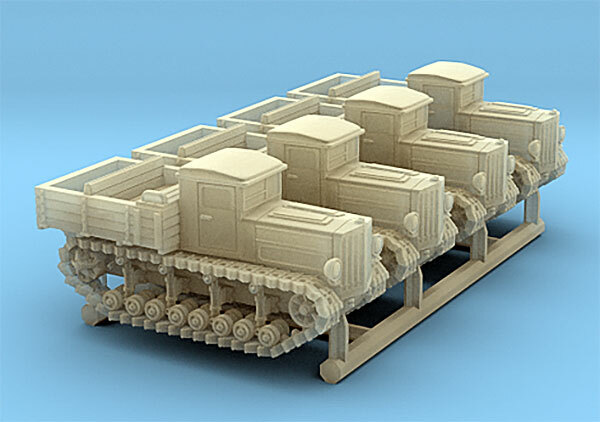 I'm tending towards making them solid for painting, since I don't want to build a multi-part model, and it would be pretty impossible to get at the inside of the cab to paint seats and what-not. Well, here it is. It's quite a beast. It's at http://shpws.me/Md5G for $18 in WSF. The engine housing was too rounded in my first attempt, so I rebuilt it. I took the opportunity at the same time to detail the radiator grill a bit more. EDIT EDIT: It's now also also available in 1/285 scale at http://shpws.me/MjpE (single model) and at http://shpws.me/MjpC (sprue of four vehicles). I've reinstated the 6-up sprue of the T-24 in 1/285 scale for sale again, having (hopefully) fixed up the issues that were preventing it printing. Buy four of these, and you can field one model for every actual T-24 ever built. Since I already had all the geometry for the T-18 light tank this was based on, I thought I might as well whack out the self-propelled gun version, the SU-18. 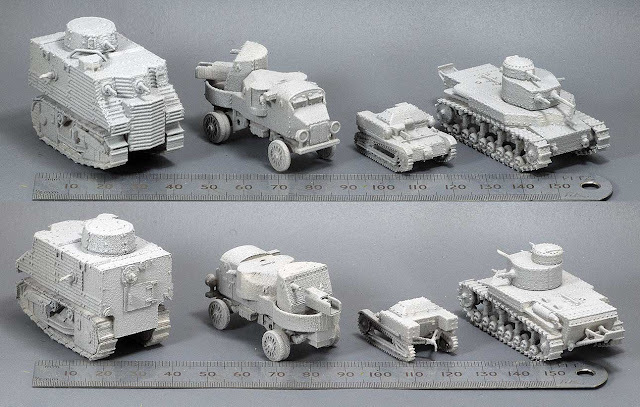 It's available in 15mm (1/100) scale right now at http://shpws.me/Mclb, with 20mm (1/72) and 6mm (1/285) scale versions to come shortly. 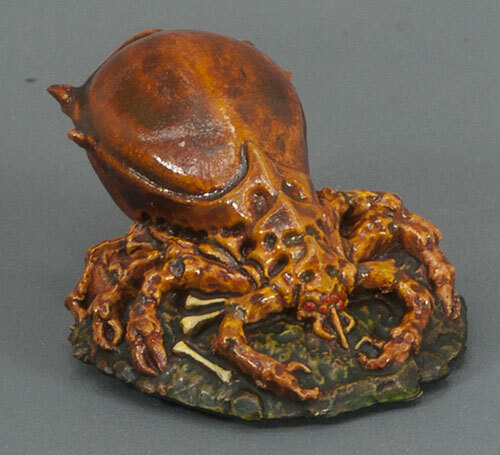 This is one of the critters I got in Reaper's last Bones Kickstarter — 91006: Prairie Tick Queen by Bob Ridolfi. It's a simple paint-job that required very little in the way of thought or skill, which suited me very well at the time. In response to a query about what Shapeways FUD prints actually look like, compared with how they're displayed in their material renders, I've put together this comparison shot. The render is the top image, the painted physical model is below. I've tried to get the two as near in size as possible, and the ruler is there for size information. As you can see, though the quality of the physical model is pretty good (considering its very small size), there is some loss and softening of detail as compared with the material render (top). This was my very first attempt at modeling for 3d printing, and I've learned a great deal since then about what needs to be emphasized or exaggerated, but there's only so much you can do in that respect. We're still stuck with the fundamental limitations of the 3d printing process. 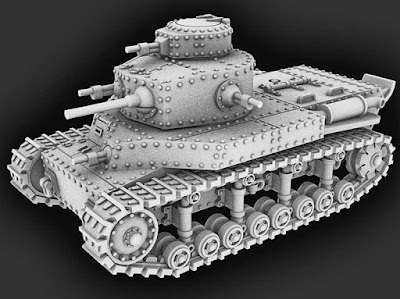 I've rebuilt my T-18 for production in 1/285 scale for 6mm gaming. It is tiny, really teensy-weensy. It comes out at just a fraction over 15mm long. 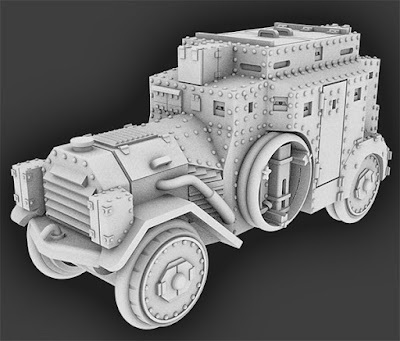 How much of that rivet and panel-line detail will show on the printed models, I have no idea. There will be some, but it's difficult to predict. The guns look idiotically stumpy and humungous, but in fact they're only 0.6mm in diameter. 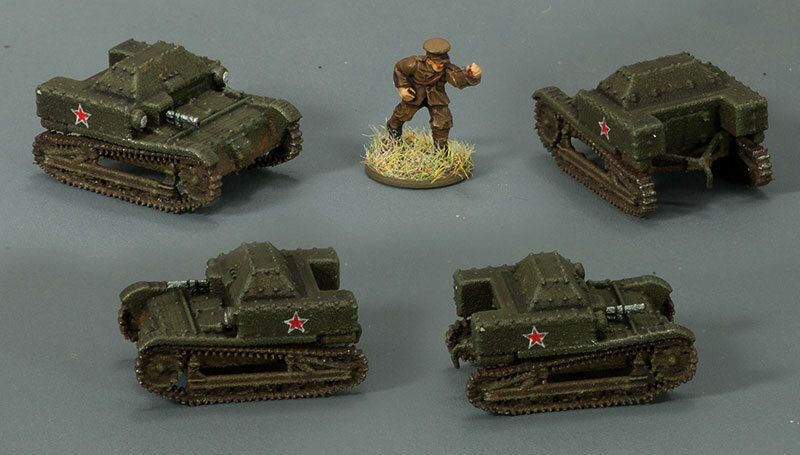 This is my 15mm model of the Soviet T-18 (also called by them the M6). It was based on the Renault FT, with the addition of vertical suspension, and was produced from 1928 to 1931. It's available at my Shapeways shop at http://shpws.me/MbEL for a measley ten bucks for WSF, and a slightly less measley eighteen bucks for FUD. 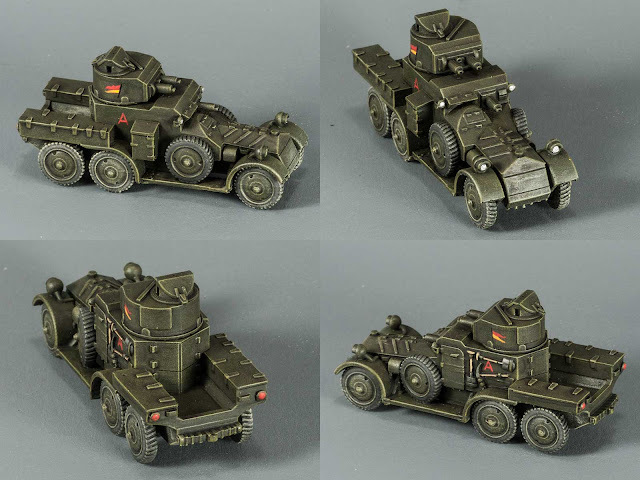 Next in the list of things I've built is this pre-WWII German armoured car, the SdKfz 3. It was a big, heavy monster of a thing. It had no provision for permanent armament, but machine-guns were often mounted on the roof, with access via a pair of large trap-doors. It took a surprisingly long time to put together. Nothing is ever as simple as it first appears. 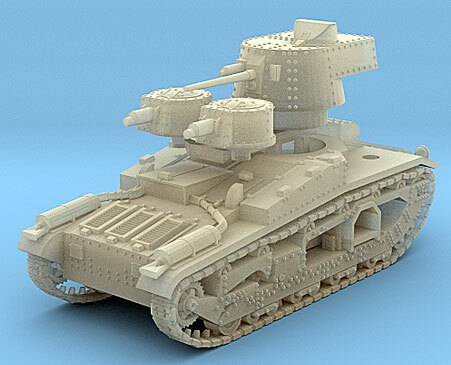 I've finished modelling the Soviet T-24 medium tank of 1932 in 1:100 scale, for 15mm gaming. It's a lot lumpier than the original: due to printing size limitations, things like rivets, track links and what-have -you have to be hugely over-scale to show up at all. It generally looks OK in the flesh. Photographs of the original are pretty thin on the ground, and tend to be very grainy and blurry, so I've had to make a few semi-educated guesses about some structures. It's available for sale from Shapeways, at http://shpws.me/Ma76. It's $15.00 in WSF, or $32 in FUD. 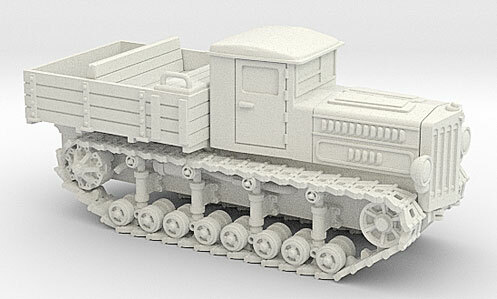 Here's my 1/100 scale (15mm) Austin-Kegresse half-track. It's a WW1-vintage machine, based on the Austin-Putilov armoured car, that went on for use after the war by the Red Army as well as organisations like the German Freikorps. This one is printed in Shapeways' High Definition Black Acrylate material. It does show detail nicely, but its 25-micron print layers really show up on curved surfaces, especially gently curved horizontal surfaces like the roof. Also, they're still coming to grips with the mechanics of printing the material — you can see distinct lateral bulges and distortions about half way up the hull, though not as bad as in the Lanchester. 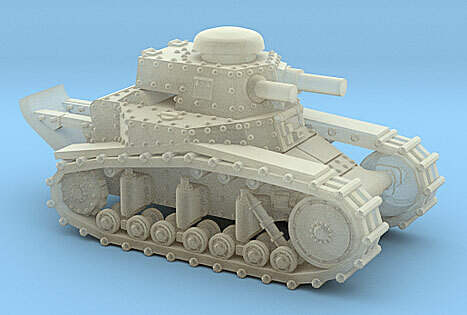 This is my 1:100 scale (15mm) Lanchester Mk.II that I had printed in high-definition black acrylate by Shapeways. The colour is supposed to be the British army's Deep Bronze Green, their standard peace-time colour for AFVs on home service during the interwar period. It's a colour that consistently defeats me; I can never seem to get close to it. Vallejo do a Bronze Green in their VMC range, but it's nothing like the army colour, being more like the colour of actual green bronze. 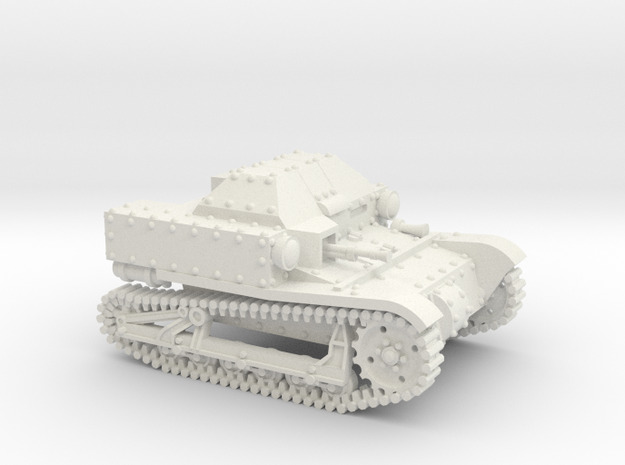 Latest in the 3d-modeling saga is this Soviet T27A tankette of 1932, based on a Carden-Loyd design. 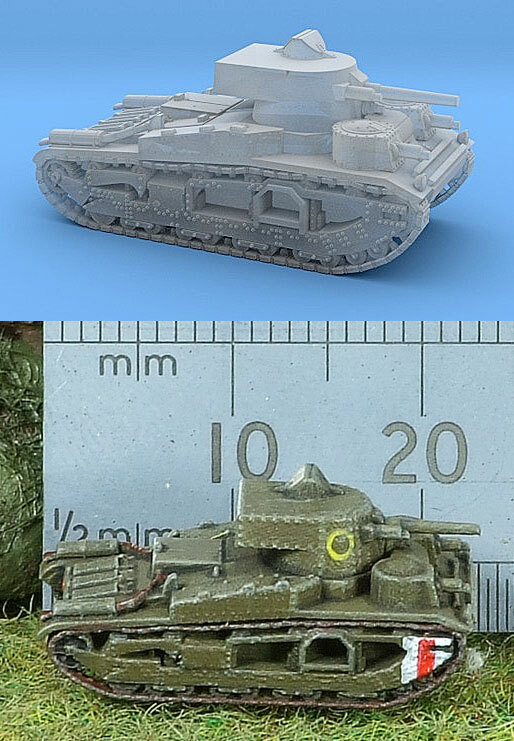 I've made it in both 15mm (1/100) and 20mm (1/72) scales. 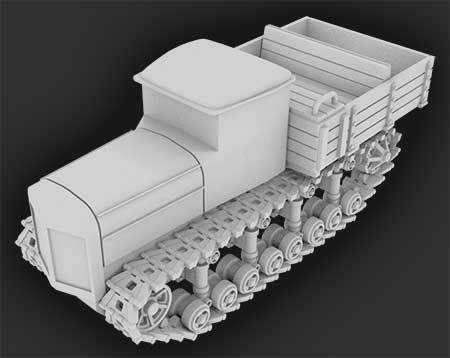 I'll probably do it in 28mm (1/56) eventually as well, though that will require quite a bit of rebuilding. It's pretty tiny — it's only about 35mm long in 1/72.